An invaluable worker stands out in many ways. Such workers are diligent, proactive, honest, accountable, collaborative, engaged, consistent and effectively expressive. Model employees also know how to apply their intellect, driving up to 90 percent of enterprise value. “The simple act of paying positive attention to people has a great deal to do with productivity,” explains business management guru Tom Peters. However, before companies get to that foundational relationship, they must first attract the types of professionals expected to shine. It’s a job-seekers market at the moment, with the U.S. unemployment rate at 4.4 percent, just above the lowest level since 2001. A streak of consecutive months with job gains now extends nearly seven years. Nonetheless, the hiring dynamic isn’t necessarily as one-sided as it seems on the surface. Gallup reports a record 47 percent of the workforce saying now is a good time to find a quality job. Fifty-one percent of current employees acknowledge that they are searching for new jobs or watching for openings. Further, a controllable factor — compensation — is the key lever when attracting candidates. Forty-one percent of employees rating a significant pay raise as “very important” when considering a new job. Income is even more significant for male workers than females, and for millennials and Gen Xers than baby boomers. When today’s worker decides to make a job change, he or she wants the process to move along quickly. A Google Consumer Survey conducted by Ajilon found that among 454 professionals actively looking for new employment, 90 percent believe hiring — from application to onboarding — should take less than four weeks. More than half think it should take two weeks or less. The current reality among employers is that average total hiring time takes close to 43 days. This is early two weeks longer than what candidates expect and demand. Additionally, employers should understand local salary variances by geographic area. As you might expect, base salaries in San Francisco run 30 percent higher than the national average for comparable positions. Other top-paying markets include New York City (23 percent above national average), Washington, DC, (+16 percent), Seattle (+15 percent), Boston (+15 percent) and Chicago (+12 percent). Areas below the norm include Norfolk (-6 percent), Knoxville (-6 percent), Oklahoma City (-3 percent), Louisville (-2 percent) and Orlando (-2 percent). Another vital element of staffing up for excellence is keeping your invaluable workers onboard for the long run. Assuming that you’re hiring at the appropriate salary level, top employees should stay ahead of the pay curve due to performance bumps, bonuses/incentives and promotions. Attention to retention pays real dividends. Consider a Society for Human Resource Management estimate that pegs the average cost of replacing an employee at six to nine months’ salary. That amounts to $20,000 to $30,000 in recruiting and training expenses for a manager making $40,000 per year. Companies must be attentive to millennials, who are quickly becoming the greatest share of the nation’s workforce. When satisfied, they’re highly committed to their jobs, according to Great Place to Work, which partners with Fortune to compile an annual listing of the 100 best company workplaces. Millennials who feel like they have a great place to work are 20 times more likely to stay with the company than peers who don’t have a strong company connection. Millennials are stereotypically cast as fickle job-hoppers. The facts say otherwise. Some 85 percent of millennial front-line employees who work at a “great company” intend to stay for a long time. For millennial managers, the figure is nearly 9 in 10 (89 percent). Take some time to analyze how salary figures into candidates’ and employees’ expectations for overall job fulfillment. 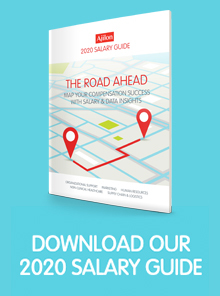 Look to Ajilon’s 2018 Salary Guide as a starting point. Where are healthcare providers six months after the ICD-10 transition?